Some Firms Are Harnessing Trump's Tweets As A Marketing Strategy President Trump's use of social media to endorse or shame companies is a new public-relations channel. Some are leveraging that to recycle old news on job creation or other investment plans. Using his personal Twitter account, Trump has publicly thanked Walmart, among other companies, for their plans to increase investment and job creation. It's not yet clear how his tweets may affect company decision making. The new president's frequent use of social media has created an entirely new kind of public-relations channel, one that companies are trying to exploit, in particular by touting their hiring announcements. 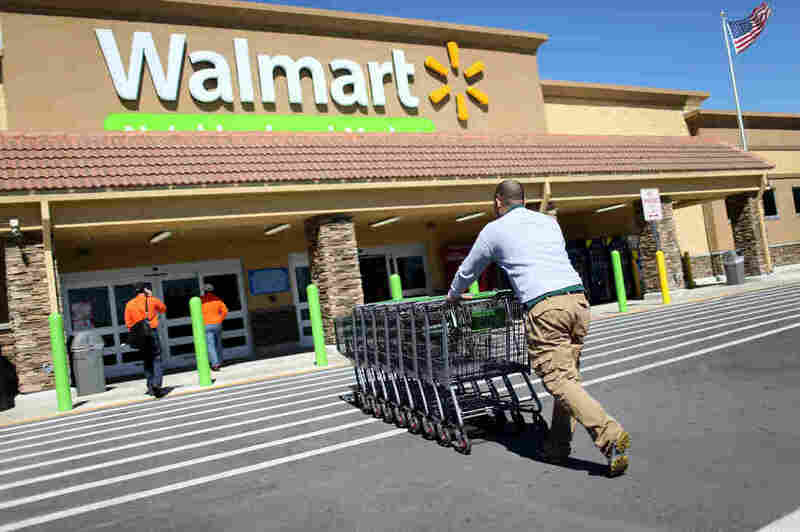 Last week, Trump publicly thanked Walmart for its "big jobs push" after the retailer last week released details of a hiring and capital spending plan that it had originally announced in October before the election. Sprint Chairman Masayoshi Son parlayed his Dec. 6 meeting with the then-president elect into several supportive tweets from Trump. Ford, General Motors, Hyundai Motors and its affiliate Kia, have all made investment announcements referencing Trump's tax or economic policies. "They're using Trump as a marketing channel," says Jonah Berger, a marketing professor at the University of Pennsylvania's Wharton School. He says it's a new paradigm, both for the president and for major company brands. "Companies didn't used to feel like they could curry favor with a president through making some moves like this, but today's day and age it seems like a possibility so companies are exploring it," Berger says. Trump's prime focus has been the auto industry, where he has named individual companies and brands as possible targets for higher tariffs on cars made in Mexico. On Monday, during his first meeting with business leaders, Trump called out Ford CEO Mark Fields and the company's decision to scrap plans for a $1.6 billion in Mexico in favor of expanding in Michigan. "Mark was so nice with the plant, I wanted to sit next to him," Trump told the business executives. Trump criticized Ford's rival, General Motors, earlier in the month because it manufactures some Chevy Cruzes for U.S. sale in Mexico. But then last week, GM said it would invest an additional $1 billion in the U.S., and Trump thanked the company in a tweet. GM spokesman Patrick Morrissey acknowledges that with U.S. job creation in the spotlight, "this was good timing for us to share what we are doing." It is not yet clear how Trump's Twitter account might shape decision making for companies going forward. Many of the investment plans Trump has tweeted were planned — or even originally announced — well before the election. Take, for example, Fiat Chrysler's announcement to increase its U.S. investment by $1 billion — which garnered a "thank you" tweet from Trump this month. CEO Sergio Marchionne told reporters that investment decision was made more than a year ago, and that the attaboy from Trump wasn't anticipated. "None of us have had a tweeting president before," Marchionne said at a Dec. 9 press conference. "It's a new way of communication, and I think we're going to have to learn how to respond." In most cases, companies are capitalizing on investment and hiring decisions that were set in motion well before Trump's election. Berger, the Wharton marketing professor, says it's not clear that companies will change investment decisions based on favorable tweets. "Whether we'll see companies actually changing their behavior, you know, actually doing different things or moving jobs in one way or another because of him, that's a little bit more costly, and I think we will see some of that, but not as much as firms taking advantage of old news and recycling it," Berger says. But the new president's approval ratings are already low, so could companies see a backlash for trying to curry favor? It's certainly possible, Berger says, but if Trump is endorsing the companies, and not the other way around, there's less chance it could backfire.